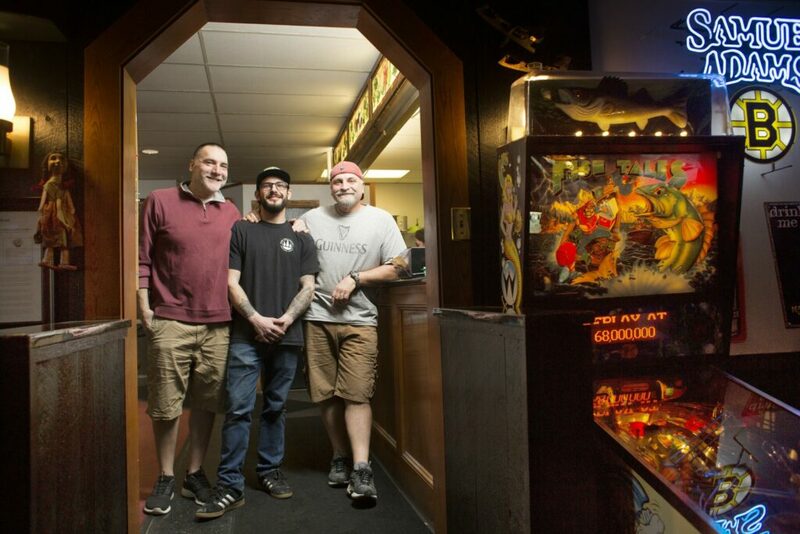 Sam and Rob Minervino were on an afternoon break from their latest project, relaunching Pizza Villa, a 54-year-old restaurant that they had recently bought from old friends. Even though the Minervino brothers were trying to keep the changes to a minimum, there was still much to do. The reopening was scheduled to happen in four days, and the bar side of the restaurant still looked like the inside of a messy antique store. Tools, old signs and other collectibles littered the tables. Bartender Doug Johnson, who has worked at Pizza Villa for more than two decades, puttered behind the bar, framed by the freshly oiled, hand-carved oak back bar that dates to the late 1800s. Freshening the look of the restaurant, along with a few key updates, was important, but so was keeping the feel of the place where generations of Portlanders have brought their friends and families for moderately priced meals and together time. For 40 years, members of the Minervino family have either worked in or owned stakes in four local restaurants, most with bars and all with the same goal – to be a place that welcomes regulars, a place where working-class people feel comfortable, are treated well and can afford the prices. At a time when the price of an entree in some fine dining Portland restaurants is nearing $40, the Minervinos’ approach is old school. They are not chefs looking for just the right place to open their high-concept eatery. They are not searching for awards or recognition in national media. They wait for the right opportunity, then take it. It’s a practical way to earn a living, but it has clearly gotten into their blood. The Minervinos are perhaps not as well known as some Portland restaurateurs, but their roots here run deep – their family immigrated to Portland from Italy in the early 20th century. In addition to Pizza Villa, which reopened March 25, the Minervino brothers and two of Sam’s children, Tom and Meg, own Tomaso’s Canteen in the Old Port, and Rob’s son Marcus has worked there. Sam owns Samuel’s Bar & Grill on Forest Avenue, where Rob is assistant manager. 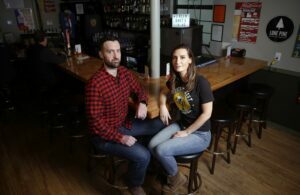 Siblings Tom and Meg are partners in Legends Rest Tap Room in Westbrook and hope to open a second restaurant together in Portland within the year. Meg Minervino, 33, had planned to be a physical therapist, not a restaurateur. She always loved helping her father, but “growing up you kind of want to be your own person,” she said. Just when she would have a job in her field lined up, her father would call, asking for her help at his restaurants. She resisted at first, but always ended up saying yes. “I guess if it’s your calling, it’s your calling,” she said. The Minervino family’s first restaurant, opened in the 1970s by Sam and Rob’s parents, Tom and Dodie Minervino, was Ye Olde Pancake Shop at 617 Congress St., later home to Norm’s Bar & Grill and now Congress Bar & Grill. (Tom and Dodie Minervino now live in Florida.) Rob Minervino, only 12 at the time, was the restaurant’s dishwasher and busboy. Dodie ran the place, which served breakfast and lunch, “everything from scrambled eggs to beef stew,” Sam Minervino recalled. From 1981 to 1988, Sam Minervino ran Sam’s Harbor Lunch on the waterfront, a casual breakfast-and-lunch spot where fishermen and other waterfront workers came in at 4 a.m. to grab a cup of coffee and a bite before heading out on the water. Rob, just out of college, joined him. Becky Rand, now known as the owner of Becky’s Diner, worked there. Sam and his wife started their family during these years. Tom was the oldest, born in 1982. Daughters Jodie and Meg came along in 1984 and 1986, respectively. (Jodie is now a mother of two and married to a lobsterman.) Many chefs get into the restaurant business today because they love food, or they want to make a name for themselves professionally. Sam Minervino viewed it as a practical way to raise his family. “He’d come over with a couple of bags of groceries and say I’m going to make your lunch specials for you today, Sam,” Sam Minervino recalled. “All I’d do is look over his shoulder and watch him,” Rob Minervino said. Sam’s Harbor Lunch was thrown off the waterfront in 1988, after the building it was in was torn down to make way for a new office-retail complex. The restaurant was not allowed to relocate on the harbor because the city decided it did not meet requirements set by the new waterfront referendum that only allowed marine-related development. (The office complex sailed through because it was approved before the referendum.) Despite the fact that Sam’s served hordes of waterfront workers, he was forced to move to Forest Avenue, where the restaurant was later renamed Samuel’s Bar & Grill. Over the next few years, the Minervino brothers had to stand by and watch as condos were built on Portland Harbor and Becky’s was allowed to open. But Sam Minervino has no regrets and holds no grudges; he says he wouldn’t be able to afford the rent on Commercial Street now anyway. And he probably wouldn’t be able to host 50-cent chicken wing nights, or serve pizzas for half price from 11 p.m. to 1 a.m.
Tom Minervino, now 37, was just 6 years old when Sam’s Harbor Lunch closed, but he has memories of the waterfront spot, where he helped butter the Italian bread before it went on the grill. “It was a treat for me to go in with my dad at 4 in the morning, and my mom would come pick me up at 9 a.m.,” he said. 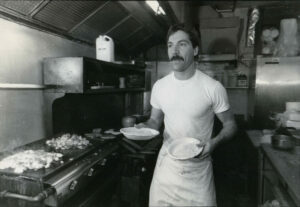 After the bar and restaurant moved to Forest Avenue, Tom washed dishes there from age 10 to 14. His sister Meg spent every morning there when she was in kindergarten. She helped make pizza and meatballs. Meg Minervino recalls with amusement that the first words she learned to spell were Guinness, Harp and Lite – words she saw in the giant mirrors above the bar. Neither sibling had plans to follow in their father’s footsteps. Tom Minervino studied political science and journalism, then worked as a sportswriter for a few small Maine newspapers and as a freelance writer. Meg Minervino studied Spanish, and health and exercise, then moved to Atlanta, where she became a personal trainer. 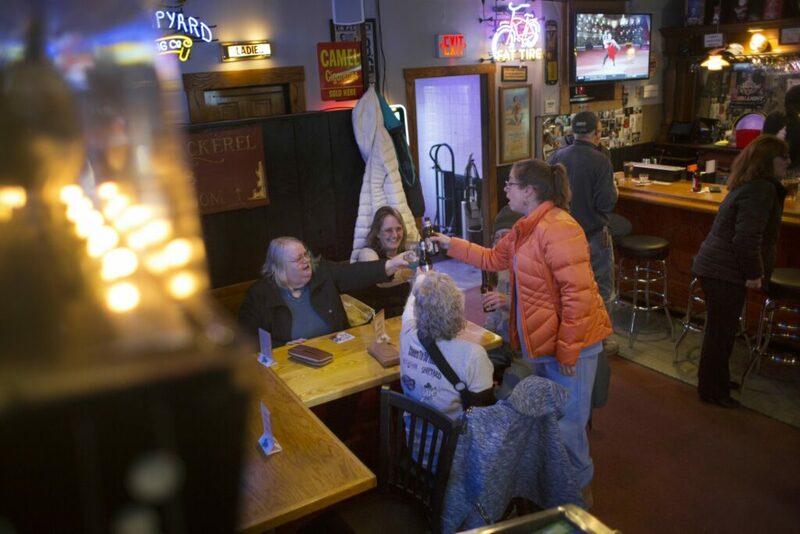 When she grew homesick for family and moved back to Maine, her father told her he could really use her at Samuel’s, so she started tending bar there and managed the place for him. Four years ago, after the city refused to renew the liquor license at Sangillo’s Tavern on Hampshire Street in the Old Port, the Minervinos leased the spot and renamed it Tomaso’s Canteen. Sam Minervino used to frequent Sangillo’s himself, and when it was threatened with closing, he even wrote letters to the editor laying out the arguments for keeping it open. He loved the space, and the people who worked there. The Minervinos spent $125,000 to gut the place and install a kitchen, according to Sam Minervino. Nothing had been touched in 25 to 30 years, he said, and the renovations also helped him put his own stamp on the place after the issues with Sangillo’s reputation. He asked his daughter to be the manager. If the young Minervino brothers had looked up to Tony DiMillo and Jimmy Lano, it was now their turn to be the old-school guys. Meg Minervino said Tomaso’s only had four draft lines, and she and her brother wanted to use them to highlight some of the newer craft beers that younger customers prefer. Her father, she said, wanted to be loyal to his longtime distributor. After a lot of back and forth, he finally gave in to his children. 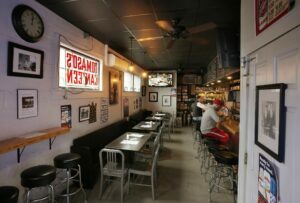 The menu at Tomaso’s includes burgers and red hot dogs, but also trendy Brussels sprouts bar snacks, seven kinds of mac-and-cheese and Italian sausage sandwiches made with housemade sausage. While cocktails in most Portland restaurants are running $12 to $14, mixed drinks at Tomaso’s are still under $10. Two years later, after Tomaso’s appeared to be doing well, Meg and Tom Minervino decided to go into business together. Meg lived in Westbrook and Tom used to live there, so that’s where they started searching for a space. They found an old pilates studio that had been on the market for a while, but it had nice wood floors and high ceilings. There they opened Legends Rest, where there’s one draft line for Budweiser and the rest are craft beers. The brother-and-sister team now have another idea in the works for a “quick food” restaurant in Portland – maybe burritos. Why take on yet another project, especially when there is so much more competition on the restaurant scene in Portland today? Sam Minervino says he doesn’t worry about competition. Nearly every Pizza Villa employee agreed to stay on – a fact that makes Rob smile. “Now when people come in, they’re going to see the same faces,” he said. Renovations included a new ceiling in the kitchen and dining area, inspection-required upgrades to plumbing and electrical, and lots of paint. Decades of unreachable dust were finally swept away. Rob Minervino and his son, Marcus, who will manage the place, bought some old church pews and cut them to fit into a corner, creating the restaurant’s first community seating space. “That’s like the VIP table now, we hope,” Rob Minervino said. The Minervinos’ idea of a VIP is one of the men’s hockey teams that the Regios brothers sponsored coming in for a bite to eat after a game. They’re taking credit cards now – a necessary nod to modern times – but keeping the sandwiches, wings and 10-inch pizzas they’re known for. The Regios brothers offered to help cook or do anything else needed in the early days of the transition. On the agenda: snapping a photo of the Regios brothers and the Minervino brothers standing at the bar, to be hung in a place of honor.